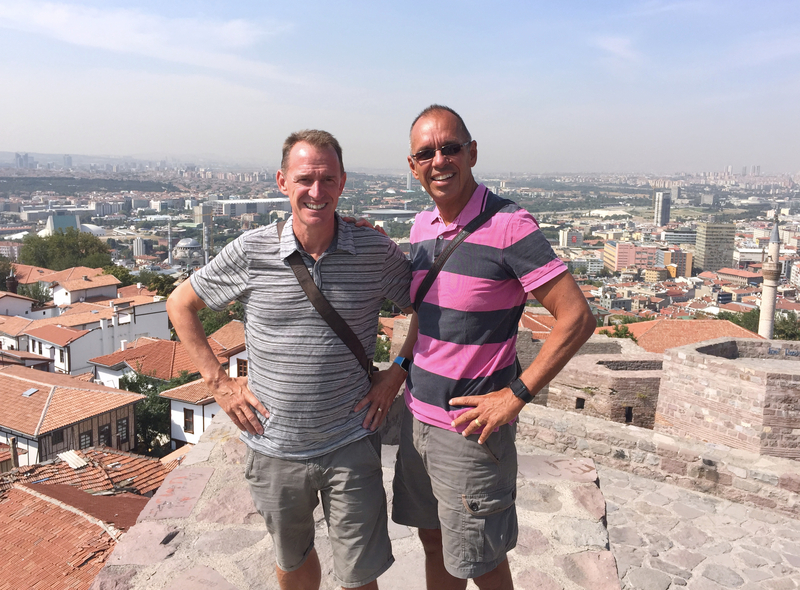 From Cappadocia we made a quick stop in Ankara, Turkey’s capital and second largest city. Second largest, but by no means the second most interesting; on the bus ride in we saw miles and miles and miles of sprawl. 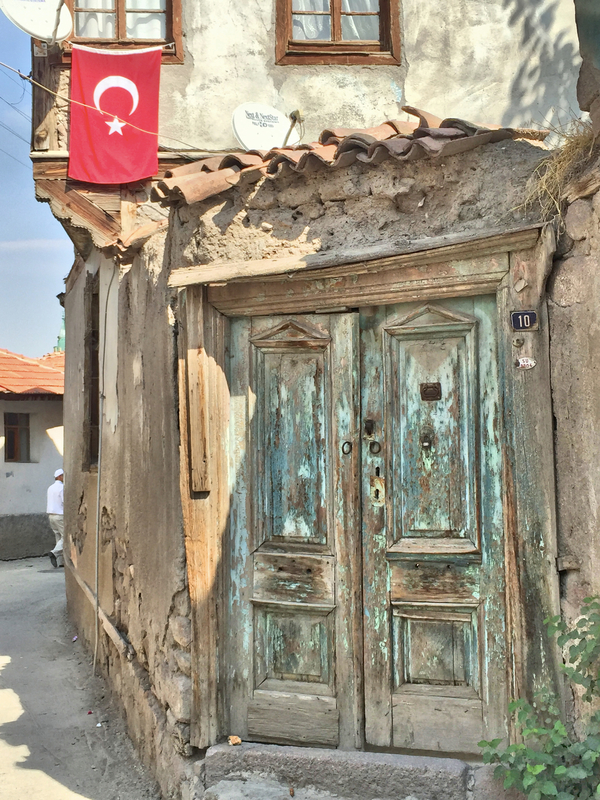 And while it’s an old city, there was really not that much going on until Mustafa Kemal Ataturk made it the capital of his revolt against the Ottoman Sultan. When he won that war and thus brought the Ottoman empire to an end, he made it the capital of the new Turkish Republic rather than maintaining Istanbul in that role. In the 1920s it was a city of 30,000, growing to today’s 4.5 million in just a few decades. 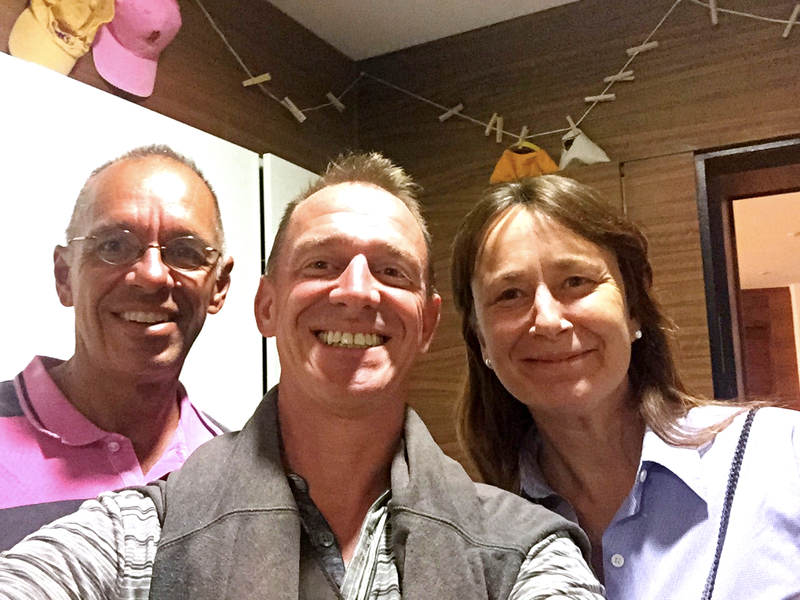 The main reason we made our way up there from Cappadocia – besides the fact that it was a nice mid-way point en route to Istanbul – is that our old friends Sara & Erik, both former graduate school classmates, live there. Eric is fairly recently retired from the U.S. Foreign Service, but Sarah is still in it, so that’s their post for another year. Over the years Mark & I have periodically thought it would fun to see them in one of their far-flung posts but until now we’ve never made it. As they’re anticipating Sarah’s retirement in a couple years they’ve bought and restored a house in Umbria, Italy, where they’ll live half the year so chances are we’ll see more of them in the coming years. In case it isn’t obvious, we like Italy. We got into Ankara pretty late one evening and were leaving early two days later, so we only had one day to see the city. With a local guide like Erik, though, we made the most of our day. 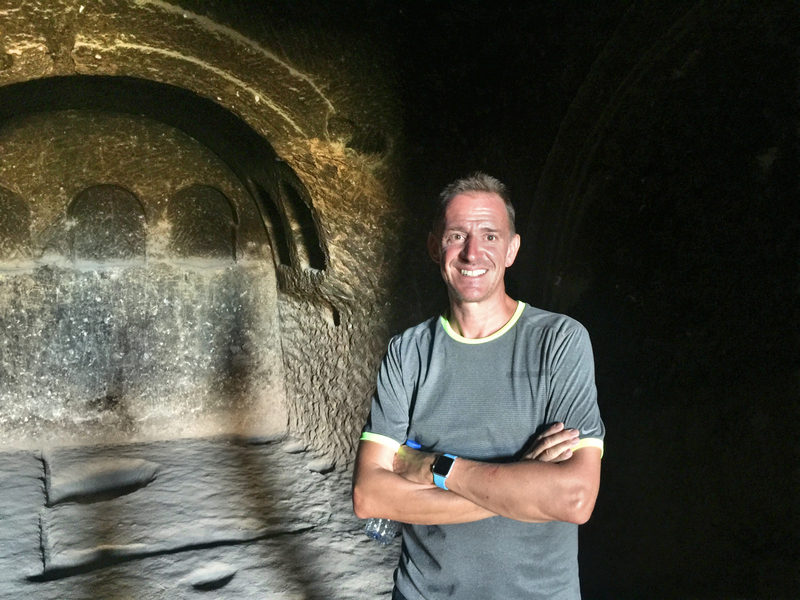 As he put it, “There are just three things you have to see: the Museum of Anatolian Civilizations, the Citadel, and Ataturk’s mausoleum.” So he showed us up to the Citadel, ruins of an old 9th century castle; 15 minutes later we’d knocked off the first assignment. Next up was the Museum, a nice little survey of all that’s gone on in Anatolia over the last 10,000 years or so. Mark & I have learned that we like modest-sized museums, and this certainly fit the bill, just a nice little taste of all the great history in a beautiful setting. Erik ran some errands while we toured the museum and then took us to his favorite kebab place right near there. 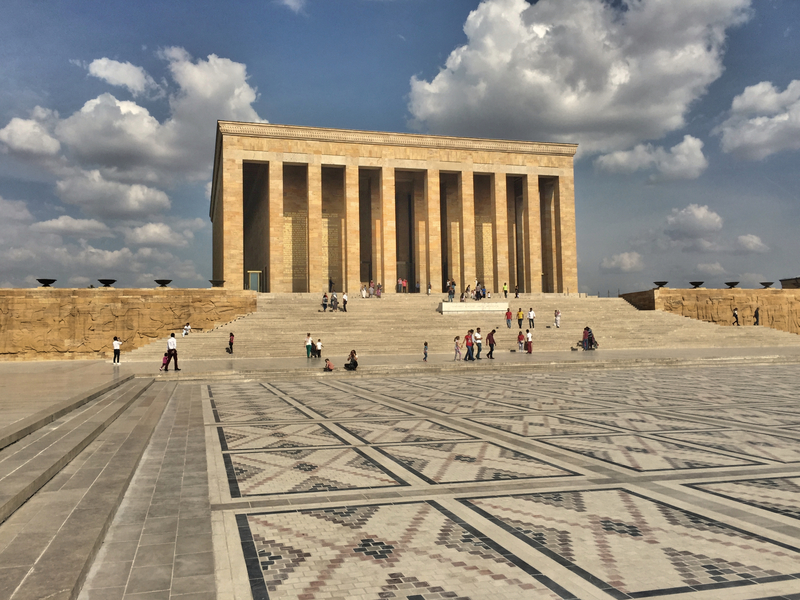 Final stop was the Ataturk mausoleum, quite the monumental bit of hagiography. That’s not to say Ataturk doesn’t deserve a hefty degree of respect. Almost single handedly he marshaled the Turks’ dissatisfaction with the way the Sultan was effectively giving the country to the European victors after World War I and created the modern democratic Turkish republic. And in the process dragged Turkey into the modern era, creating the secular state that’s so important to the region today. The mausoleum is intended to inspire awe. 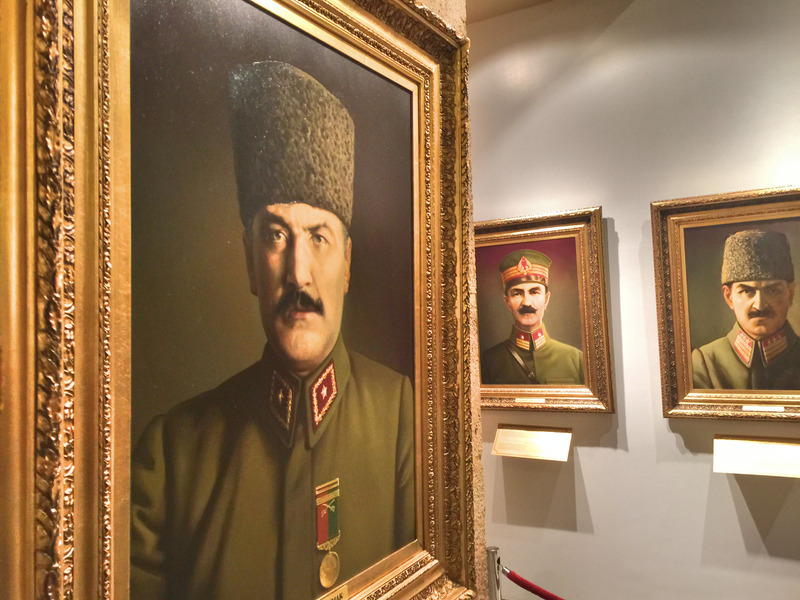 It was certainly big, and there were lots and lots of pictures of Mustafa Kemal Ataturk. So that was it – some ruins, a museum, and a mausoleum. 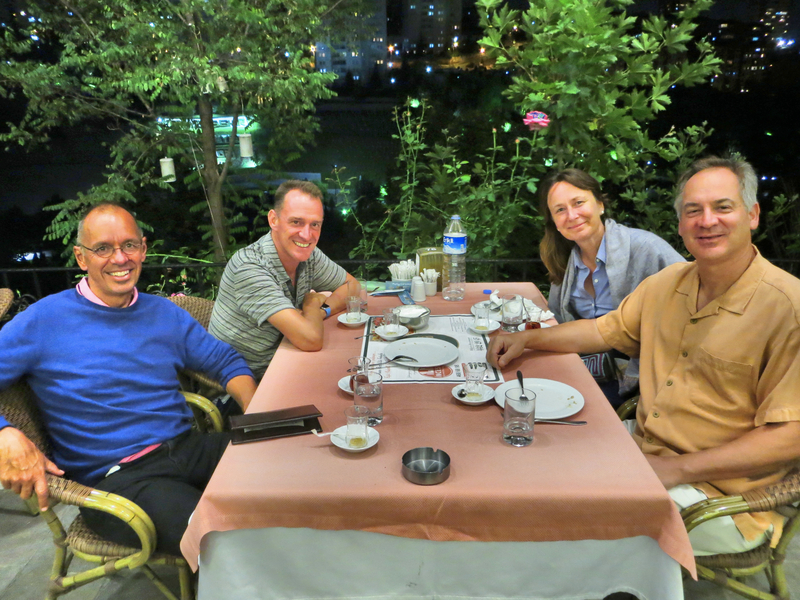 Then a couple dinners with Sarah & Erik and we were off to Istanbul. Sadly, they were off to a four-day Blue Cruise down on the coast from Bodrum. Sadly, I say, because they’d planned it with friends who had to cancel. And then, after weeks of fabulous weather, the forecast was for storms on their arrival. We haven’t heard how it went yet, but the signs were not positive. The Citadel is in the midst of the old city, which, in some cases is genuinely old. We thought we might pick up this fixer-upper for our next condo project. A selfie with Sarah as she got home from work. I was amused to note that in a house of four people while we were staying with them, the only one working was the only woman. 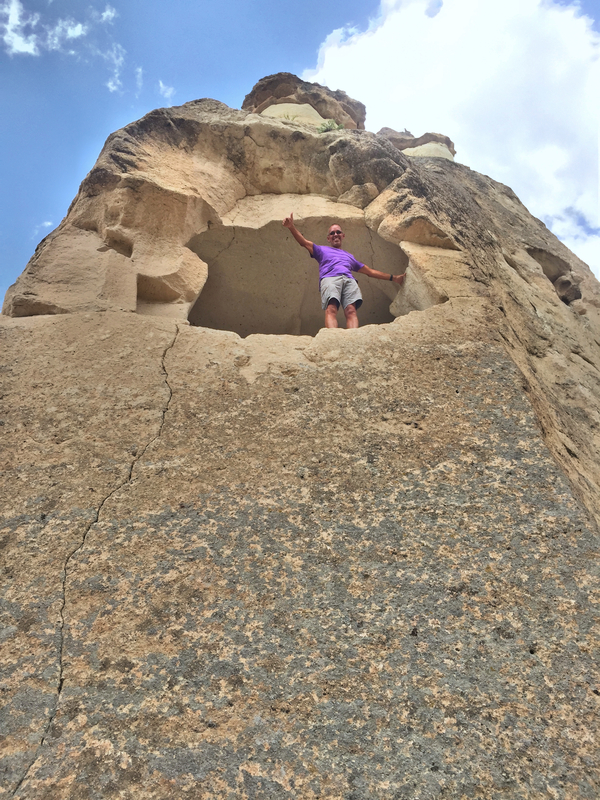 From Egirdir, we were off to Cappadocia, a region of central Turkey famous for crazy rock formations, hot air ballooning, great hiking, and churches, monasteries, and homes cut into rocks. It’s a place we’ve wanted to go for many years, so we were pretty excited to finally be off. 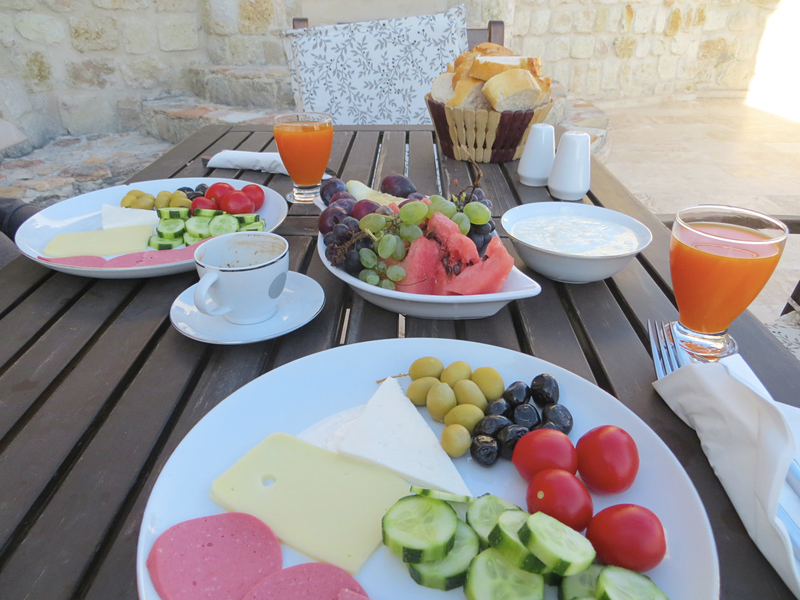 Breakfasts on the balcony in Ürgüp were feasts of olives, tomatoes, cucumbers, meat, cheese, fruit, yogurt, and eggs that came later. That’s the way to start a day! 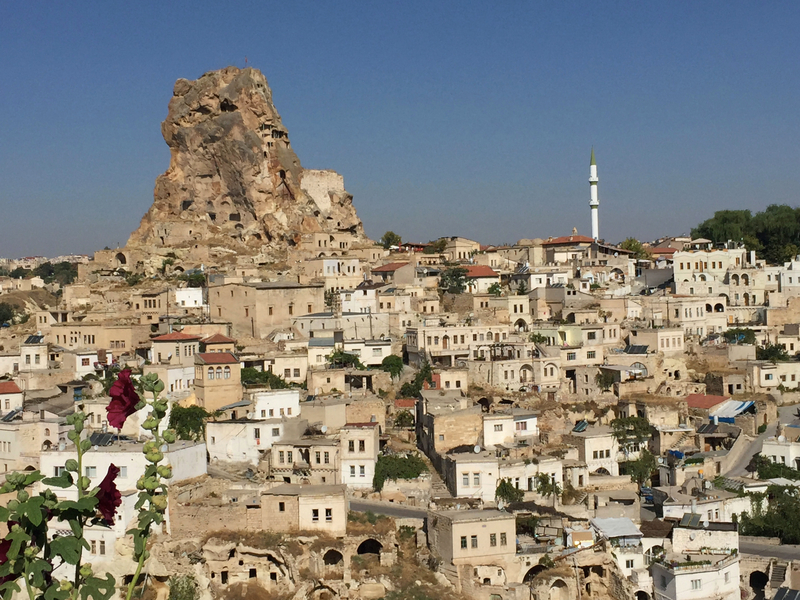 First, though, we made a one-night stop in Konya, a city of a little over a million people; the goal was both to break up the long journey to Cappadocia and perhaps to see the famous Whirling Dervishes. We succeeded at the first – two three- to four-hour bus rides beats one seven-hour day – but not so much at the second. For the record, the Whirling Dervishes are part of the Sufis, a mystical branch of Islam. The Dervishes are ascetics who use “spinning” as a form of active or physical meditation in their effort to reach what the Buddhists would call enlightenment. It’s not a tourist thing; these are serious worshippers and Konya, their home, is kind of the Bible Belt of Turkey. Well, our hotel was a little less central than we’d hoped or expected, and one afternoon and evening before catching our morning bus out just wasn’t enough time to figure out the town or where to see these Dervishes. We did, though, have one of those moments when you appreciate the kindness of strangers. Being in the Bible Belt, most of the restaurants don’t serve wine or liquor, but we found a well-rated restaurant that seemed as though it would work for us. It was, though, a 20-minute cab ride away. Fine; we’ll get a taxi. Except for whatever reason, there just weren’t any. Our hotel called a few times and none came. 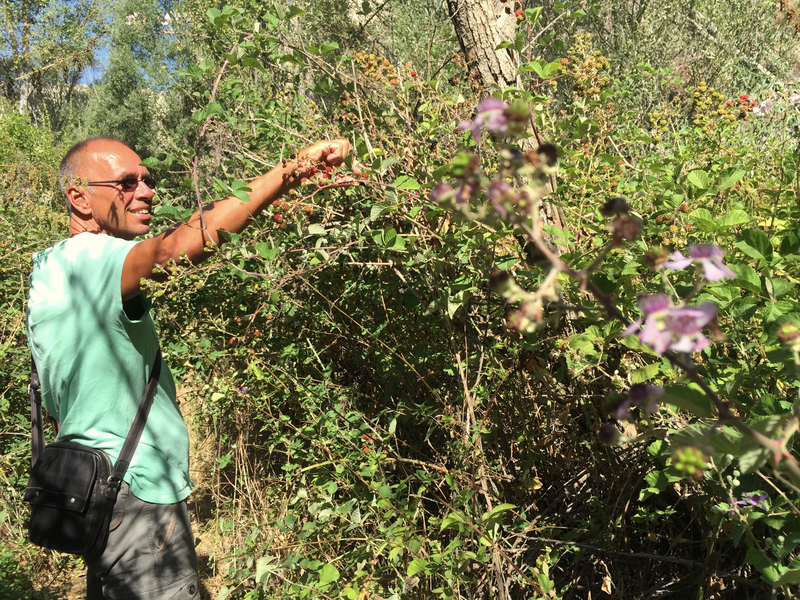 To make matters worse, there was another hotel guest – a Turkish businessman – waiting in front of us, and after 15 or 20 minutes waiting we were getting desperate. Finally his taxi pulled up, he drove away, and then came back a few minutes later. The driver had explained why there were no cabs and so he had the cab come back to pick us up. He had the driver drop him off first, as his destination was closer, told the driver where we were going, and paid for the whole fare upfront. What a nice guy! 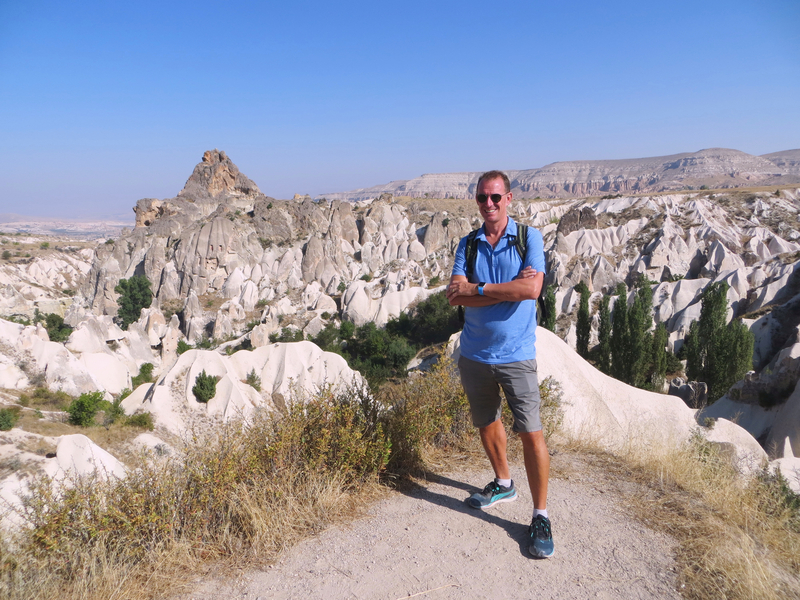 The next morning it was off to Ürgüp, the little town next to Göreme National Park, one of the prime destinations in Cappadocia. 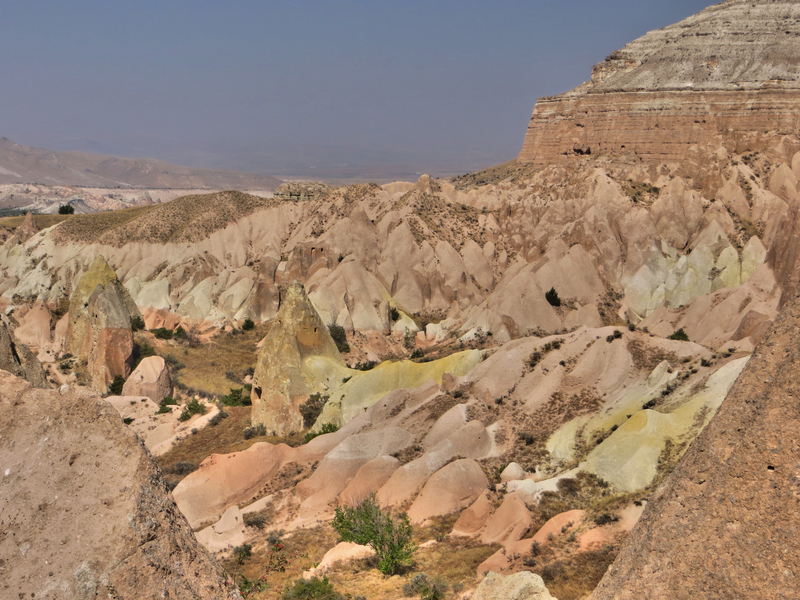 How do you describe Cappadocia? It’s an other-worldly landscape of towers and valleys cliffs, the result of millions of years of volcanic activity and erosion; in places where harder rocks sat atop softer volcanic ash, everything would wash away (over many years, of course), except the part under the rock. Voilá, fairy chimneys. This is going to be one of the most photographed stops on this epic adventure. 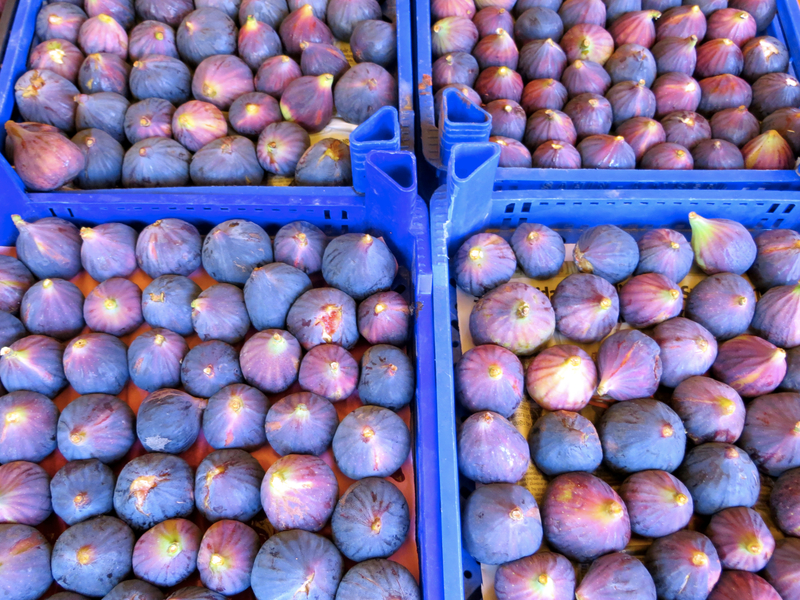 We love local markets. 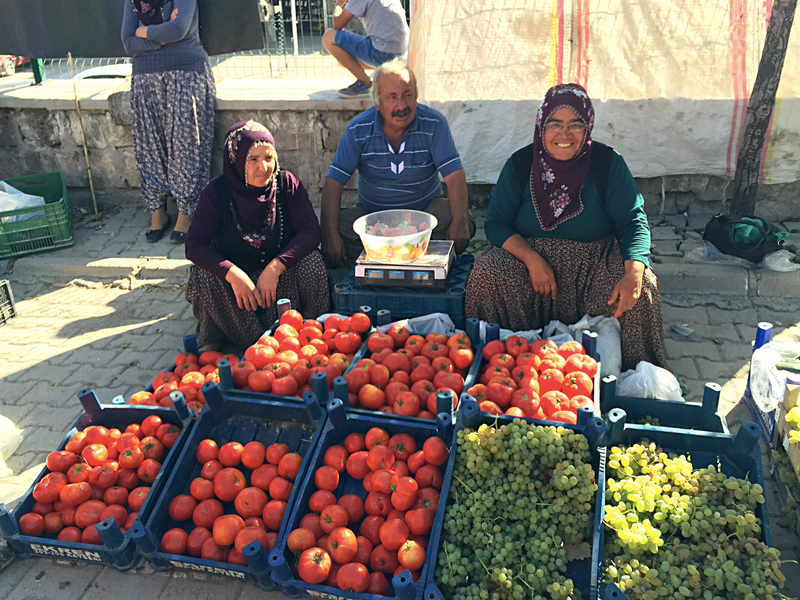 Here are three Turks trying to sell some of their produce. 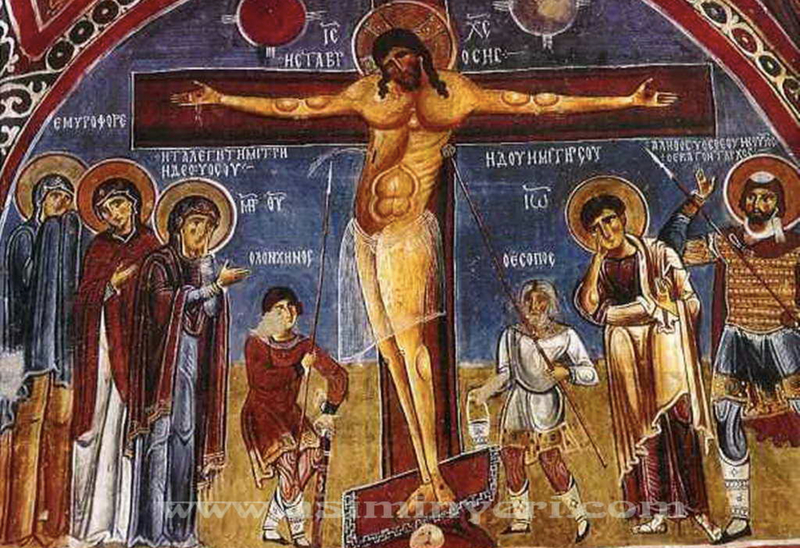 And then there’s the strange human history, how this part of Turkey became a refuge for early Christians escaping Roman oppression starting around the 4th century. 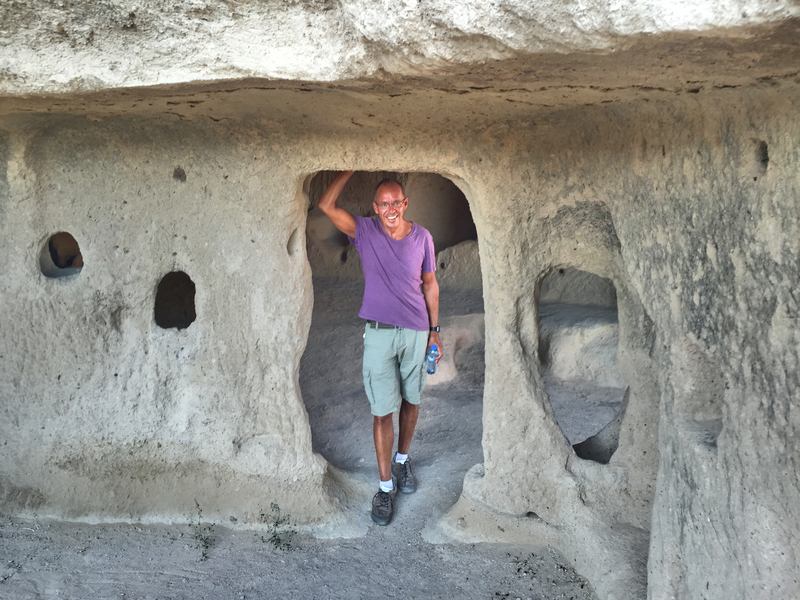 Discovering that the rock formations were relatively easy to dig into, they dug out churches, cathedrals, monasteries, homes, villages – entire underground cities. 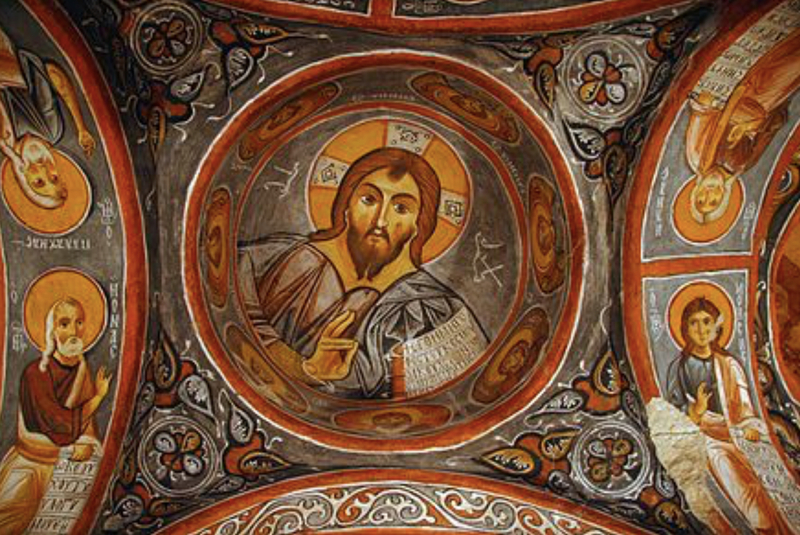 And so today as you hike through the valleys of Cappadocia you encounter untold numbers of Byzantine-era churches cut into the rocks, in some of which you can still see the old art. It’s truly awe inspiring. 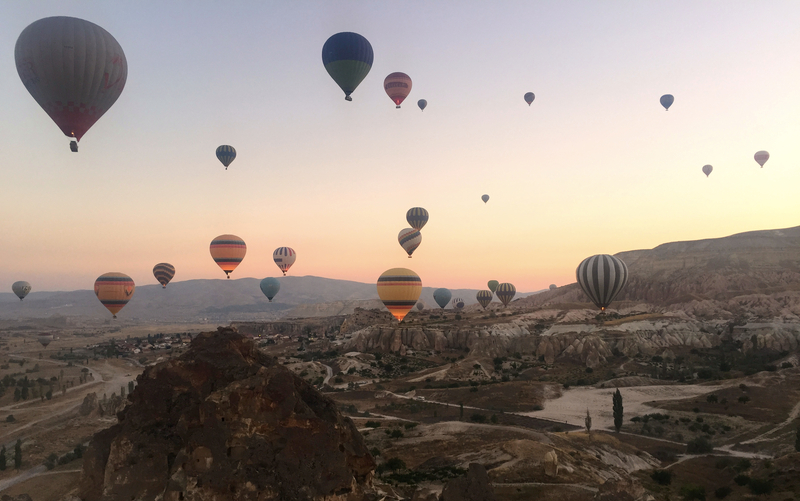 Day One in Ürgüp was a big one: up 4:15 AM to go ballooning at daybreak. 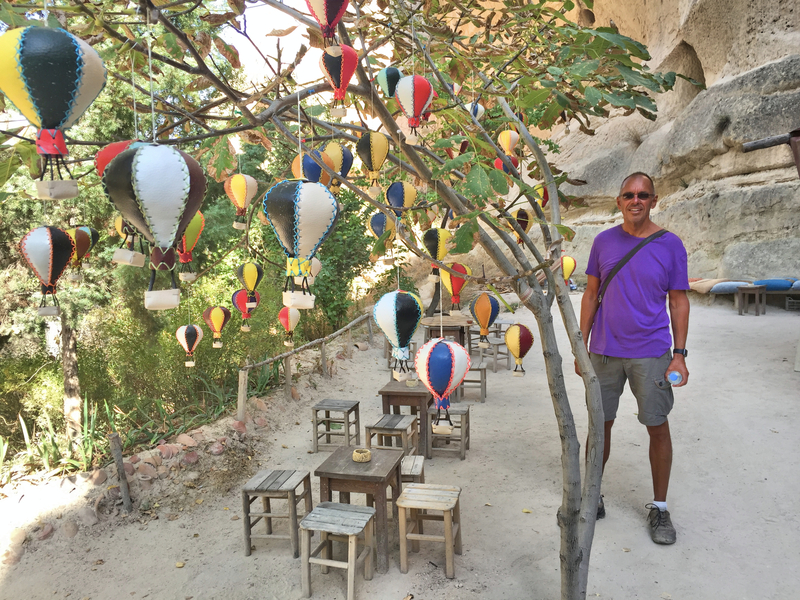 Ballooning is a big deal in Cappadocia. Back in late 2013 Mark & I went ballooning for the first time in Bagan, Myanmar, and I asked the pilot, an American who had flown in many parts of the world, what his favorite place was. 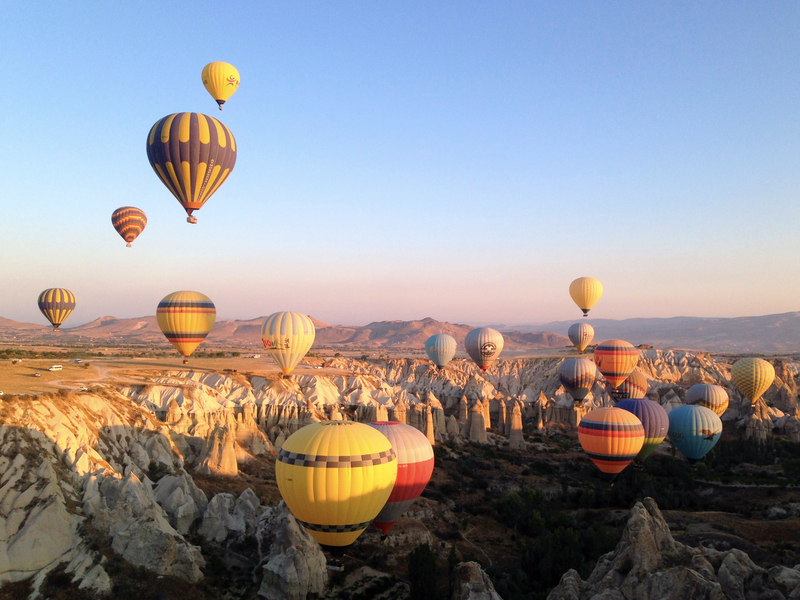 Without hesitation he answered Cappadocia. So we had to try it again, right? Well, maybe not. The first time in Bagan was super exciting and interesting and unique. The second time was … less so. Still beautiful with wonderful views. Watching the other balloons floating through the air and sailing over some of the rock formations and so on was very cool. 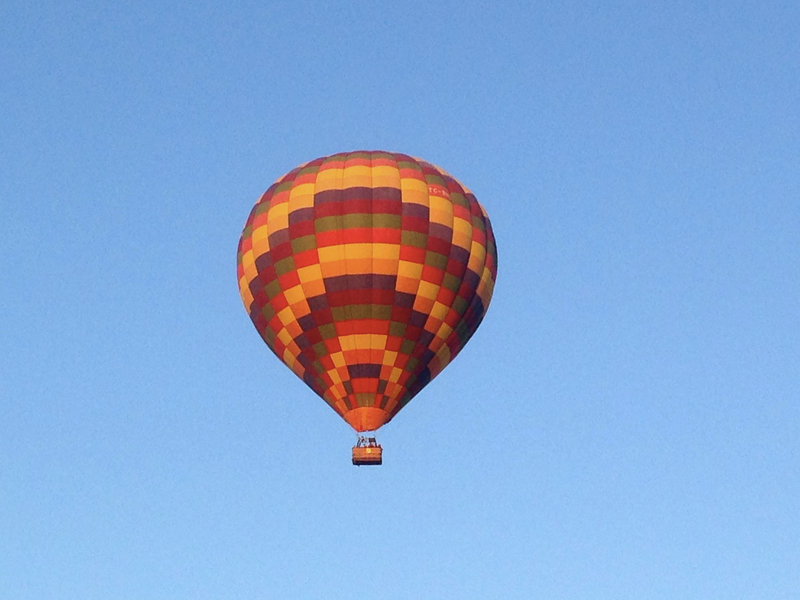 But for us, at least, ballooning isn’t something we have to do that often. 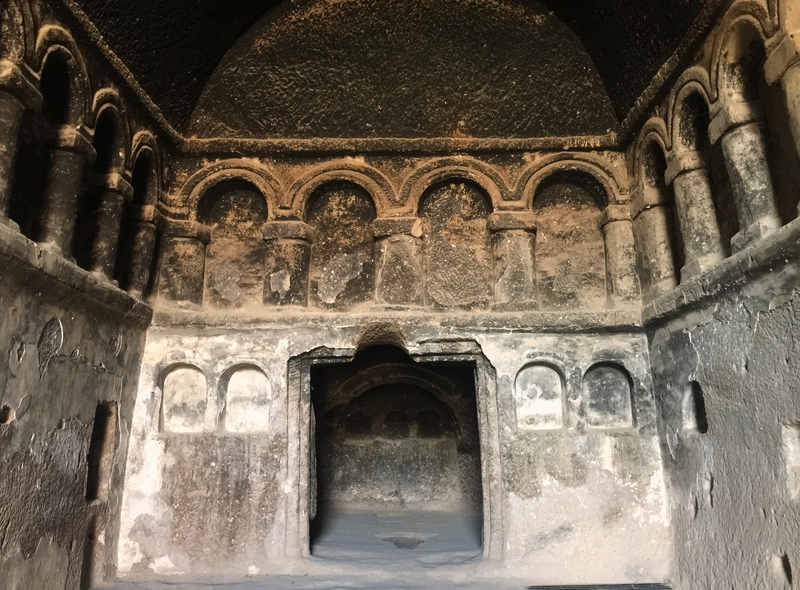 By 8:00 AM we were back at the hotel for breakfast, and by 9:00 we had a car and driver to take us to Idhara Valley, a drive about an hour a way, to hike the valley and have our first experience with all these rock-cut churches and dwellings we’d heard of. It lived up to its hype. It seemed like every hundred or two hundred meters there was another sign pointing to another church cut into the side of a cliff. It didn’t take too long to figure out we didn’t have to see all of them, but several of them were worth the climb. Two things about the valley stood out in particular. 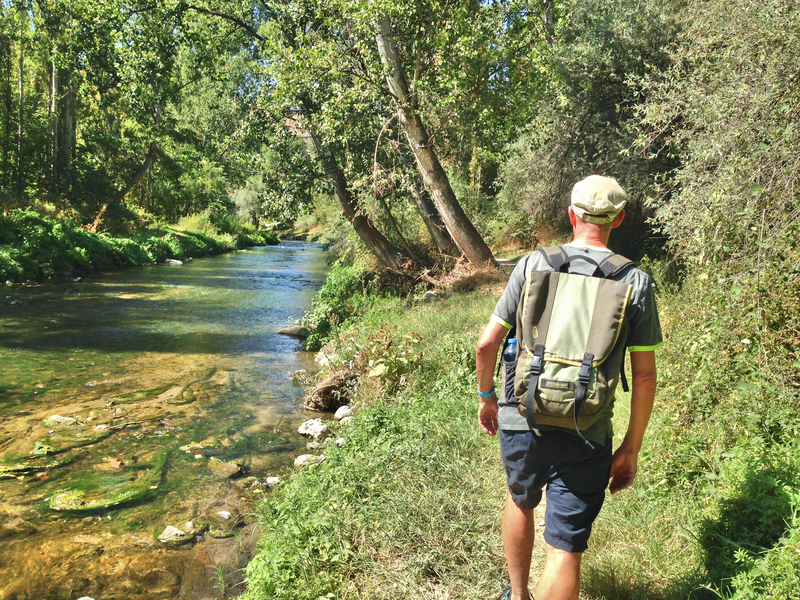 First, we discovered something we would come to love about hiking in the region. 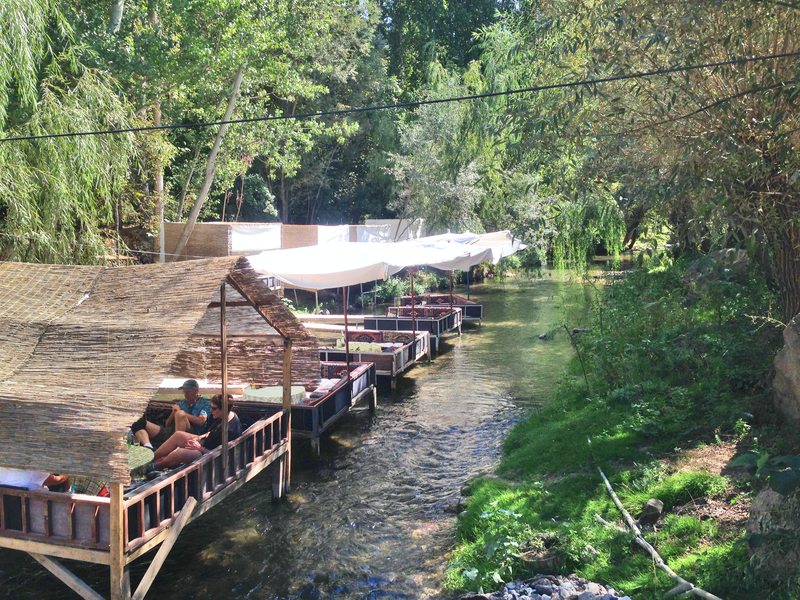 Scattered about on these hikes, seemingly in the middle of nowhere, a little café will pop up. Just a little place to stop, take a break, maybe sit on some comfortable couch, and have a cup of tea. The first one we saw had platforms built over the little river cutting through the valley along with fresh-squeezed orange juice. Over our five days in the area we saw some that were more basic, some more elaborate. But all welcome. You just wonder how many 30-cent cups of tea you have to sell to make a living, particularly when, just a short distance from any trail head, we saw very few hikers. The other was our first big underground cathedral, Selime Cathedral at the end of the valley. Wow. It’s hard to describe what an impressive architectural phenomenon some of these underground structures are. 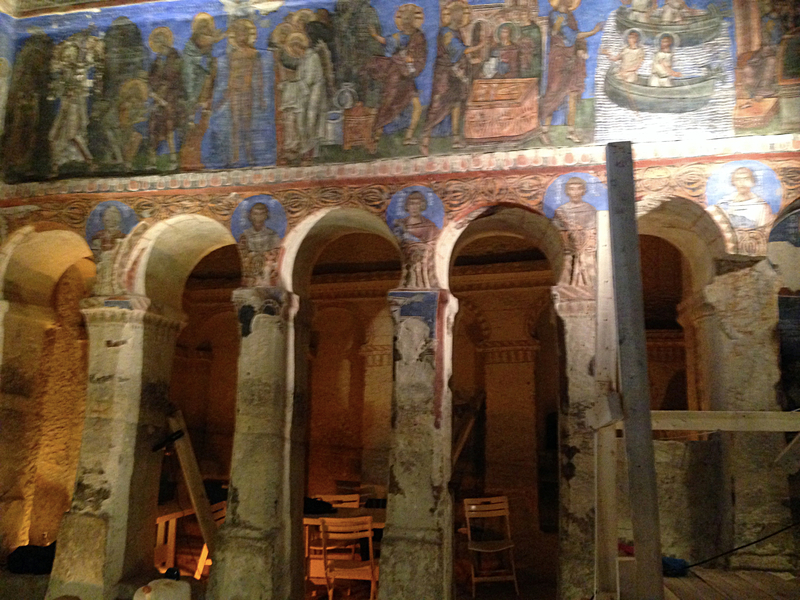 Instead of cutting rock somewhere, carrying it to a building site, and then building a big cathedral, these early Christians just dug out the rock and left in columns and tables and chairs and pulpits – everything you would need to live there. While the vast majority are fairly simple structures, some are very elaborate and complex. And this was all done with the tools available to people over a thousand years ago. Stunning. 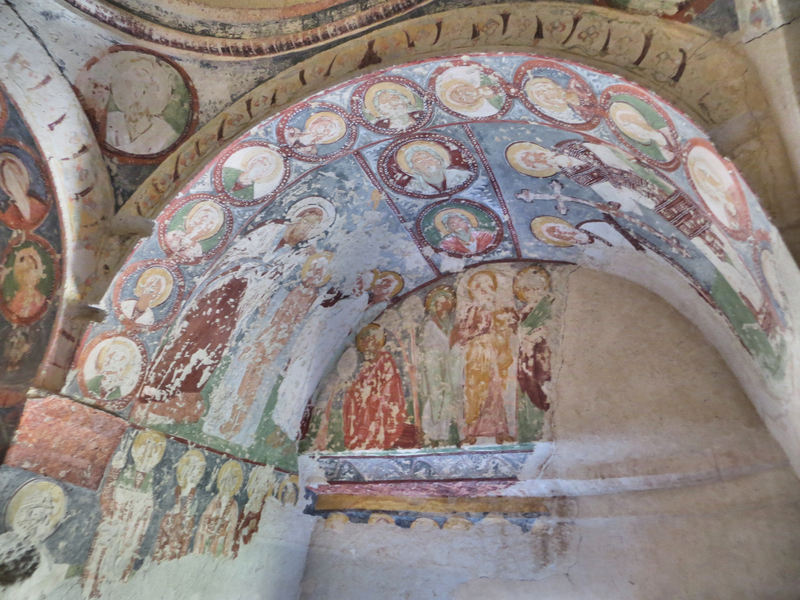 The most impressive church we saw was the Dark Church in Göreme’s Open Air Museum. Because it has essentially no natural light, the frescos have stayed remarkably vibrant (that and some touch-up work still ongoing). Photos are not permitted, so this and the next one were shamelessly taken from the web. Over the next few days, then, we did a lot more hiking. 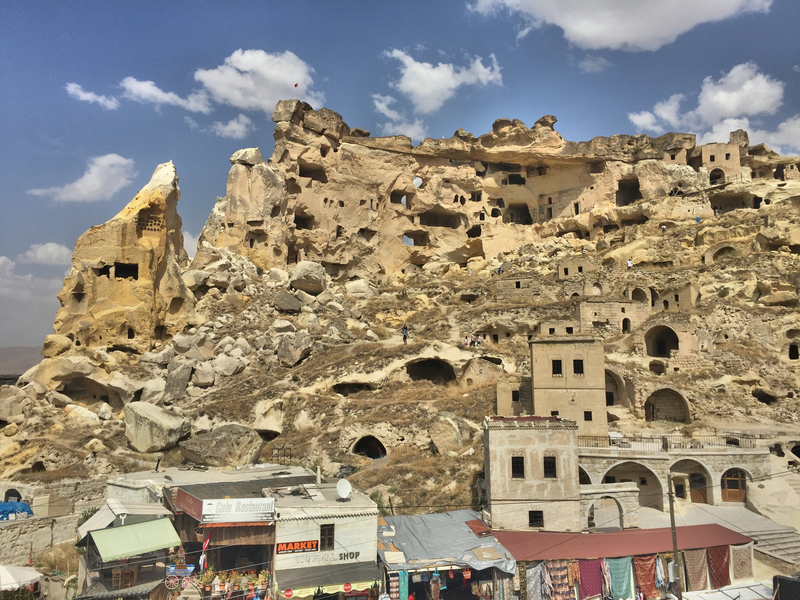 One day we took a taxi to the neighboring town of Göreme, home of a UNESCO World Heritage Site “open air museum,” a remarkable area of more of these underground churches and homes. 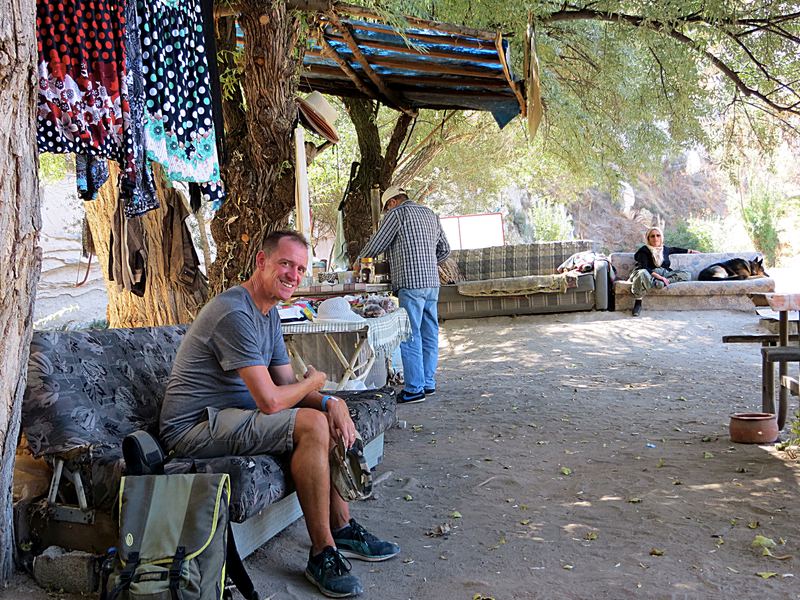 One day we wandered through the local Sunday market before the owner of our little eight-room hotel drove us to a trailhead where tour busses can’t go, meaning we would largely have the valley to ourselves. (Speaking of the kindness of strangers, he also offered to do our laundry for free so long as we didn’t need anything ironed. Traveling as we do, offers of free laundry are about as good as life gets.) 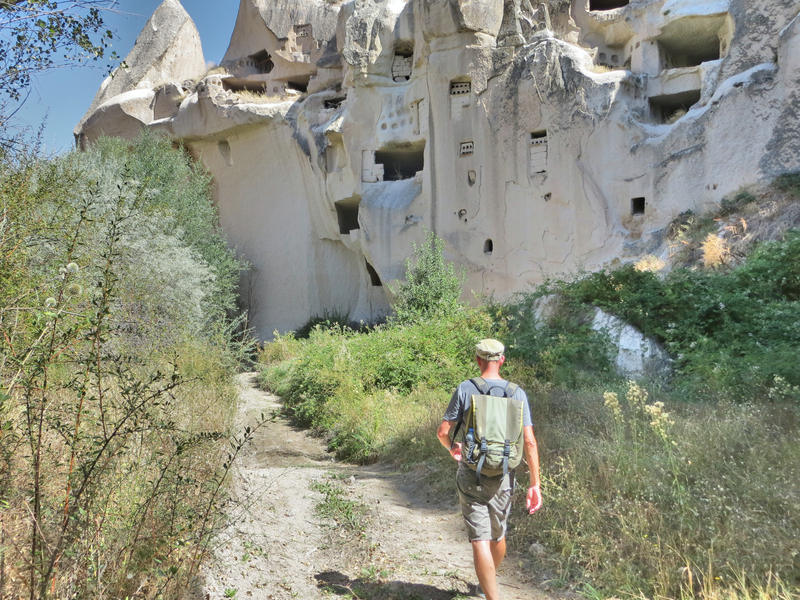 Yet another day and we’re off to another great hike through the Göreme National Park, along the beautiful Rose Valley trail. This was the good life. Hiking, hiking, and more hiking. Mark’s knee is pretty much recovered, if that’s not obvious. 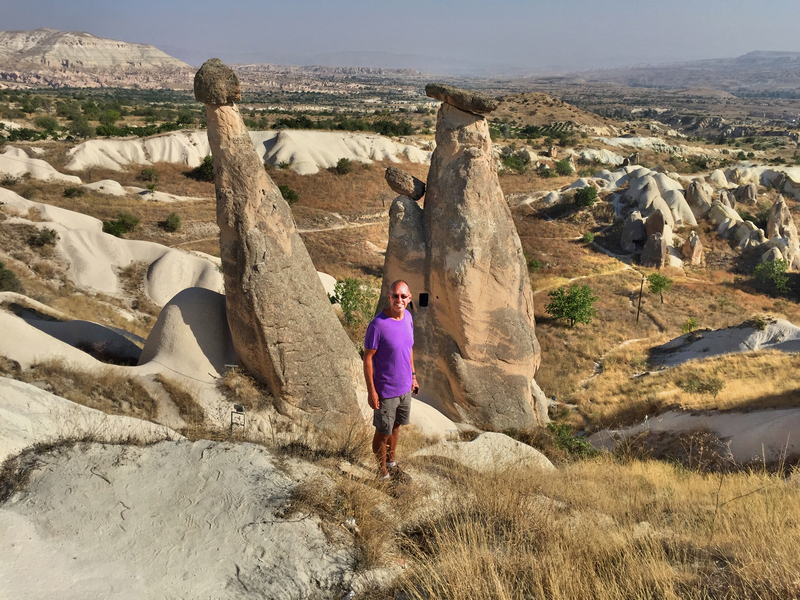 We had five days in Cappadocia, at the end of which I’ll admit I was genuinely tired; we covered a lot of miles by foot. 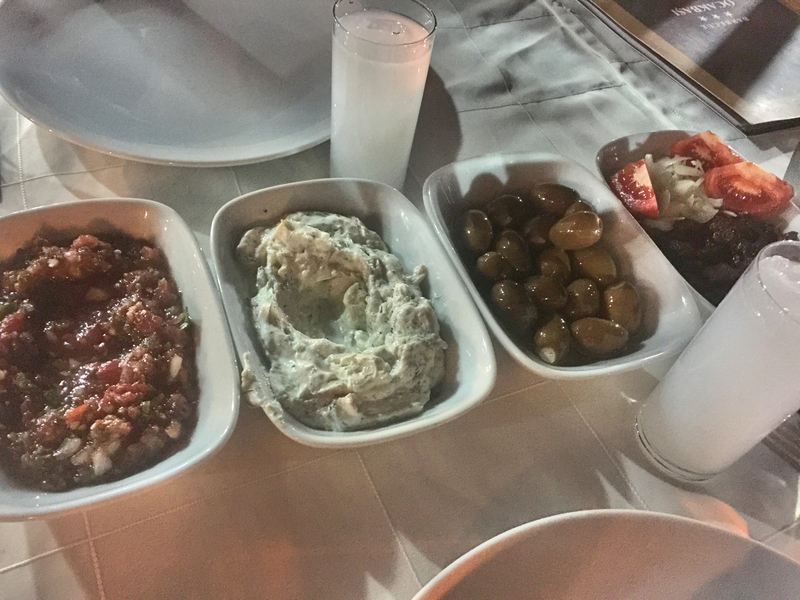 Still, though, there’s a ton we didn’t see, including entire areas of the region south of Ürgüp. 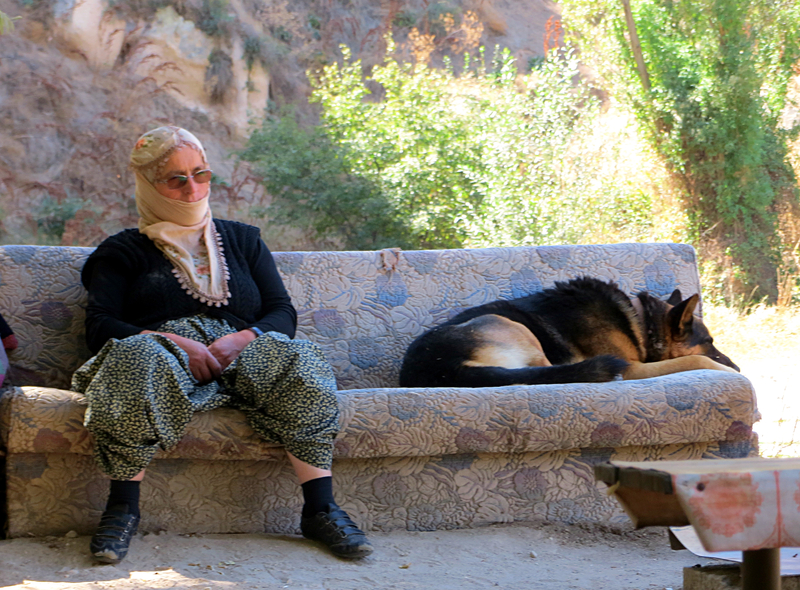 So we’ll have to come back, but we keep saying that about just about everywhere we go in Turkey. Except maybe Konya. 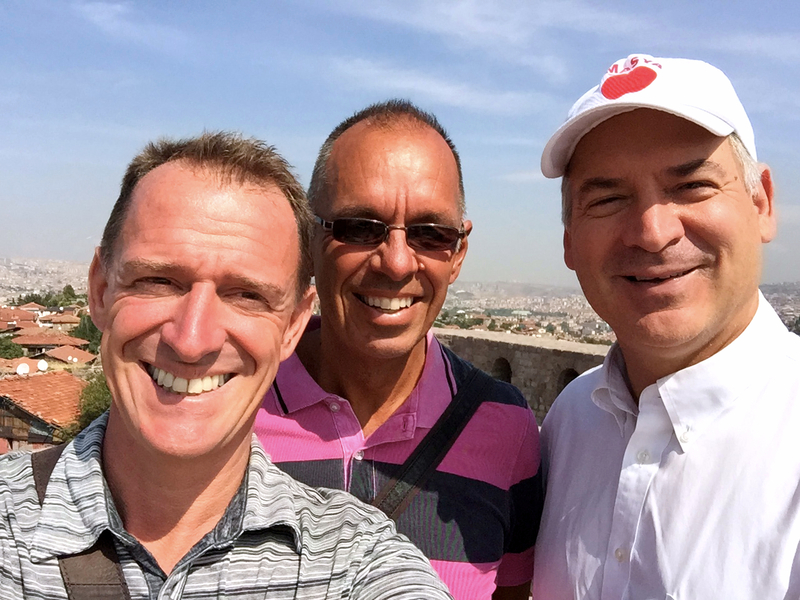 From Ürgüp we’re making a quick two-day stop in Ankara, the capital, where old graduate school classmates of ours work at the U.S. Embassy. Then it’s off to Istanbul for our final five nights in Turkey. Great country for wedding pictures! I mean, does that look like a pleasant place to enjoy a book during a break from the hike? 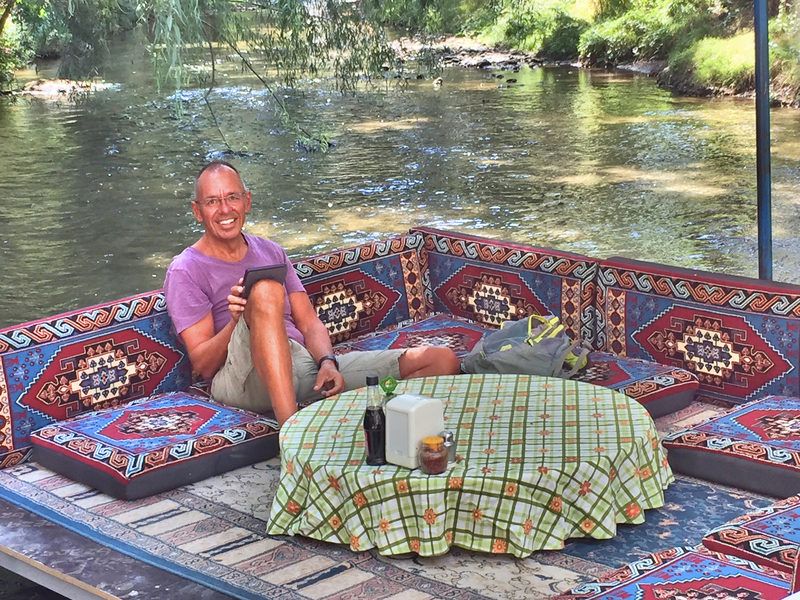 A very low-key café in the middle of the trail that tour buses can’t get to. How much business can they do? Note the woman and her dog sitting on the couch on the right. I thought that was worth a closer shot. What’s her life like, sitting at this very quiet cafe while her husband makes tea for the rare passer by? All these pictures and I haven’t even shown the balloons yet! And another café along a trail. At this stop the British-born girlfriend of the owner showed as a detailed map of the trails, giving us great suggestions for the rest of the day’s hike. 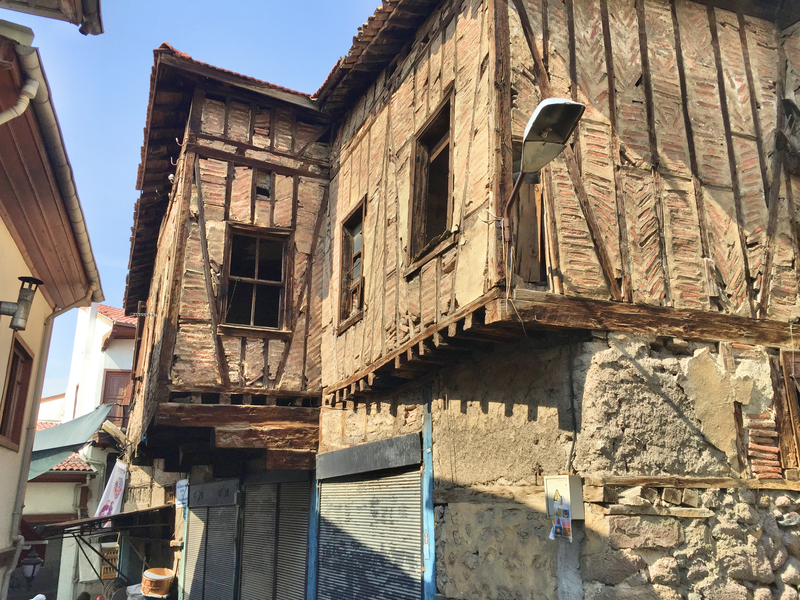 A lot of what we want to see and experience in Turkey – Bodrum, the Turquoise Coast, Cappadocia and Istanbul coming up – are pretty standard tourist places. Sometimes, though, we like to take advantage of the time we have to try something a little more unusual. 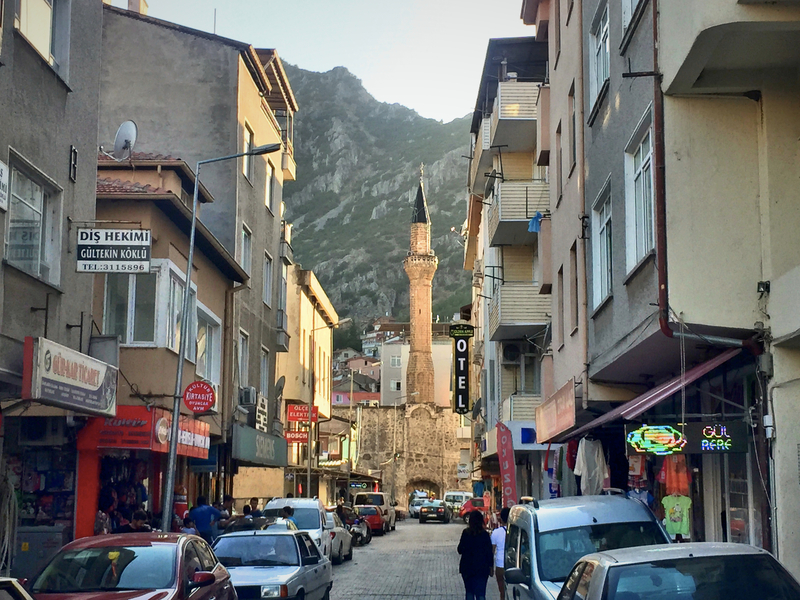 Enter Egirdir, a town of about 20,000 people about 115 miles due north of Antalya. 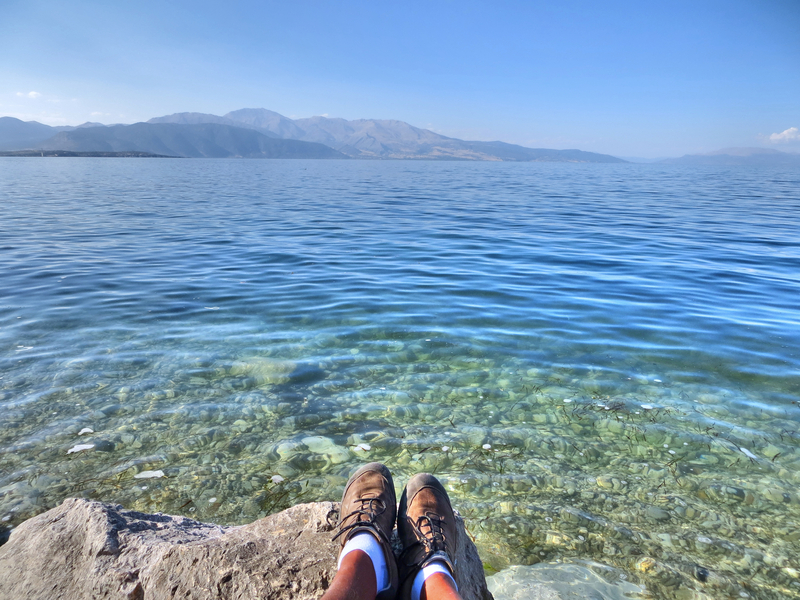 Egirdir sits on the shore of Lake Egirdir, a beautiful freshwater lake about the size of Lake Tahoe (or, for Minnesotans, a little smaller than Mille Lacs), and thus attracts tourists looking for a little adventure. 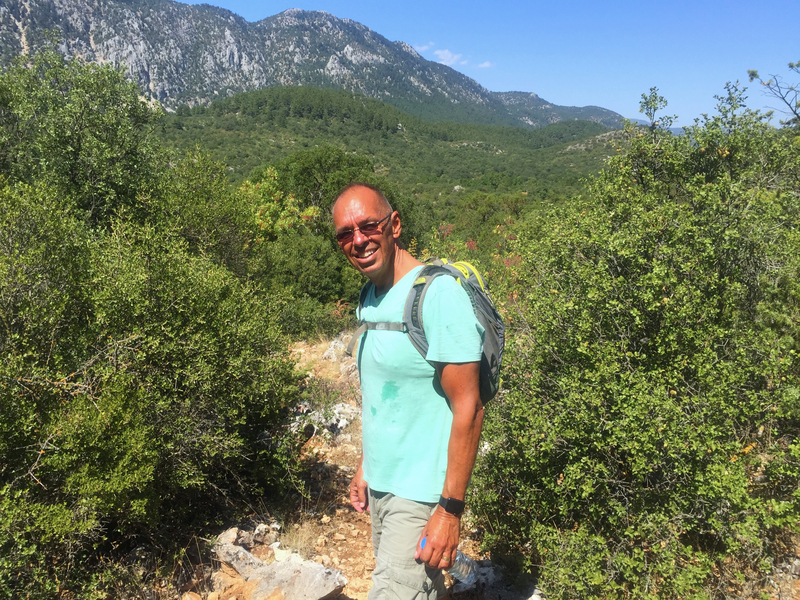 And at about 3,000 feet above sea level, the climate was a lot more temperate than what we’ve been experiencing in Turkey. 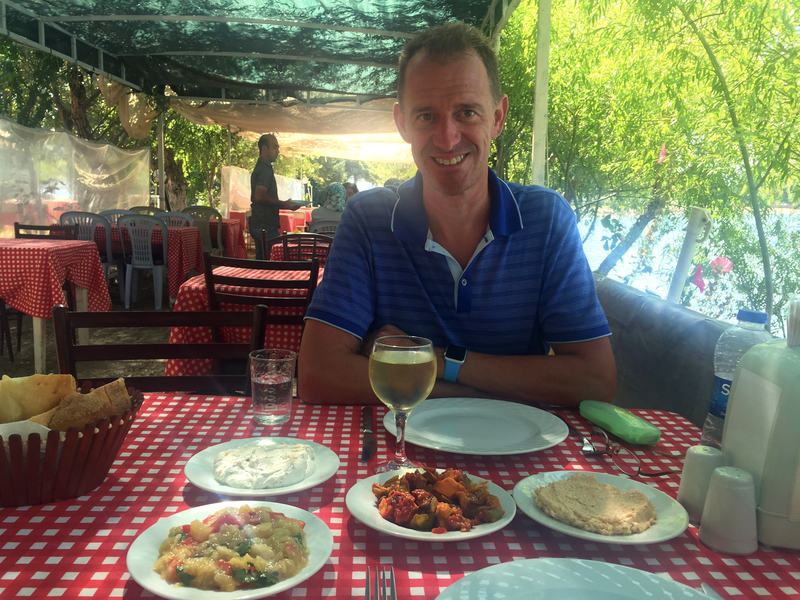 Our little two-day/three-night stop consisted of one longish and kind of hellish bike ride and a beautiful day touring yet more old Greek and Roman ruins. For our first full day in town we rented bikes to ride 20 miles out to Lake Kovada National Park. The ride was described as “through apple orchards,” while Lonely Planet says the park is “nice for hikes, picnicking, and flora.” Sounds good, right? Well, not exactly. 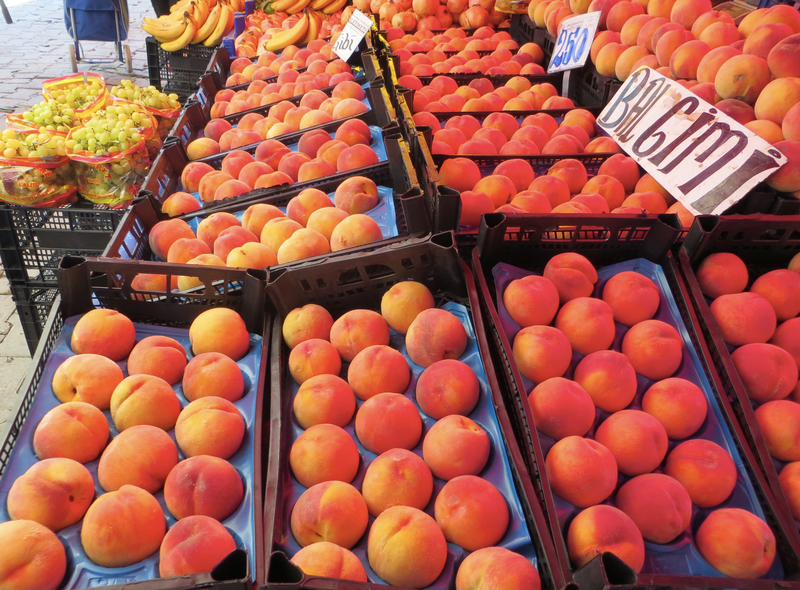 The ride was on a road beside apple orchards, and they were beautiful with miles and miles of millions and millions of ripening apples along with a few assorted apricot, peach, and pear trees. 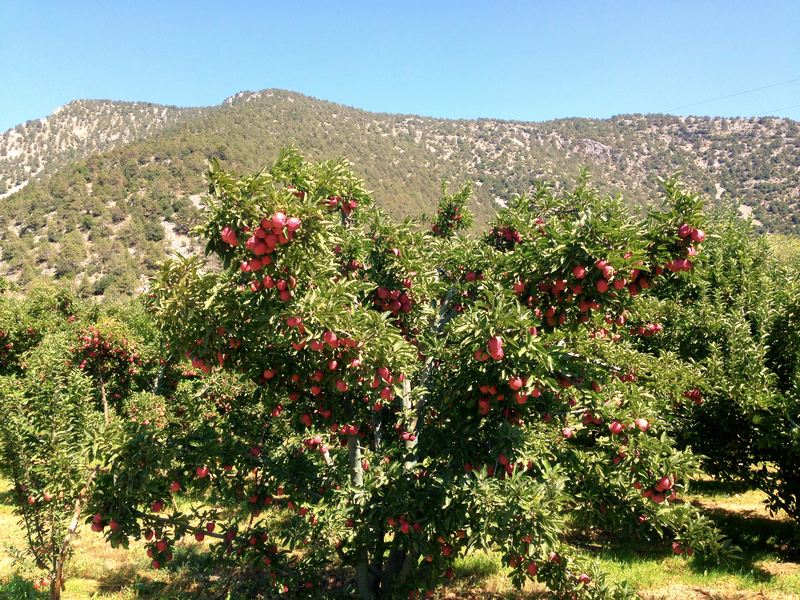 The problem was that “through apple orchards” made it sound cool and shady, when in fact the ride was in the blazing sun. And the park? I think of nicely watered and even manicured lawns for picnics and all that. This one, not so much. There were pretty limited facilities of any sort and the trail was pretty basic without particularly attractive views or anything. And then the ride back. It so happens that when you’re biking on a slight downhill stretch you don’t really notice it; you just think you’re making good time. Until, of course, it’s time to go back. On the return, then, we were riding slightly uphill. Oh, and into a headwind that had come up. And now in the mid-afternoon heat. Officially I enjoy biking in most any situations, but this was a tough ride back; I’m not sure Mark has forgiven me yet for suggesting the ride and I was still sore the next morning. Our second stab at an adventure in Egirdir was measurably more successful. Sagalassos is unlike other ruins we’ve toured. 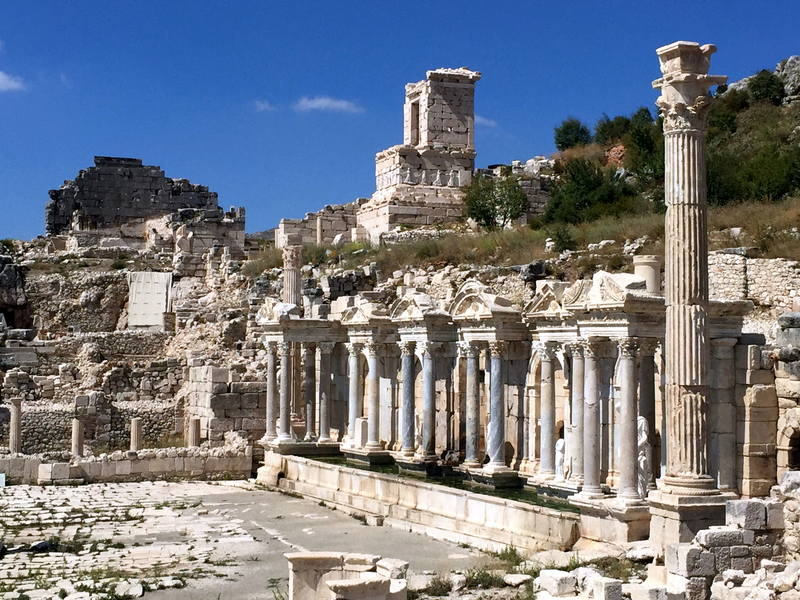 It was an important regional city 2,000 years ago, but it was never of the importance of a place like Ephesus. 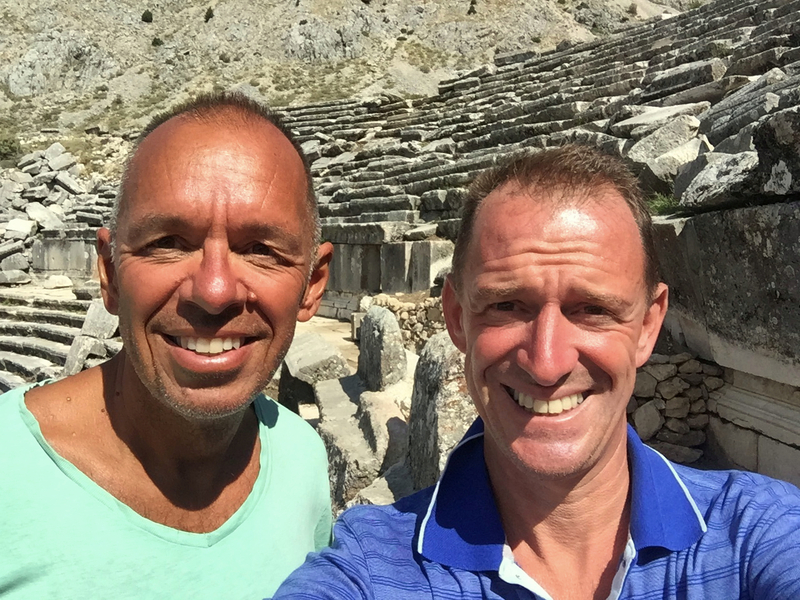 At an altitude of 5,300 feet, it’s high up in the Tarsus Mountains and thus significantly cooler than other sites we’ve toured. 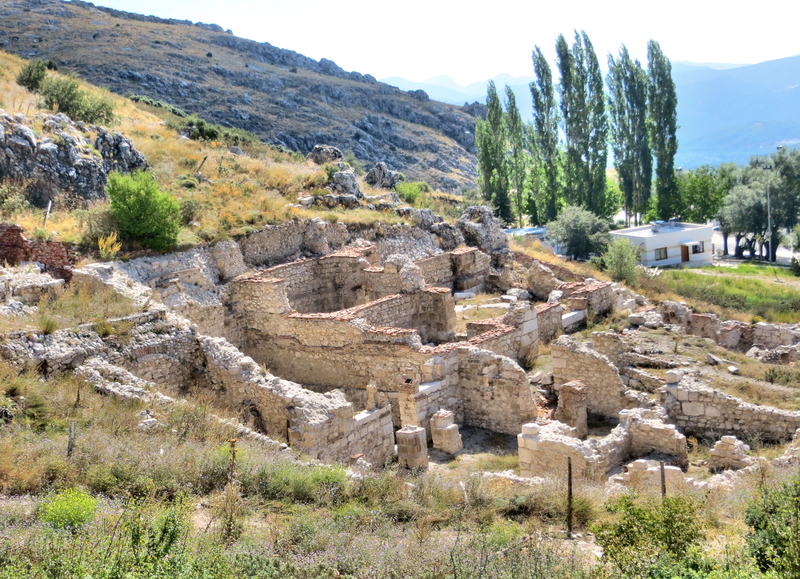 Although the city was destroyed by earthquakes and devastated by the plague, after it was abandoned it was never pillaged and thus makes for a great opportunity for archeologists. Very much an excavation in progress, it is almost entirely, utterly free of tourists. The little pension we were staying at arranged for someone to drive us up there and let us walk around as long as we wanted. The town had prospered under Roman rule in large part because it exported grain to Rome, which seems so improbably based on the land and climate today, which seems anything but agri-friendly today. The scientists who study this stuff, though, remind us that 2,000 years ago the climate was somewhat more mild with measurably more precipitation. 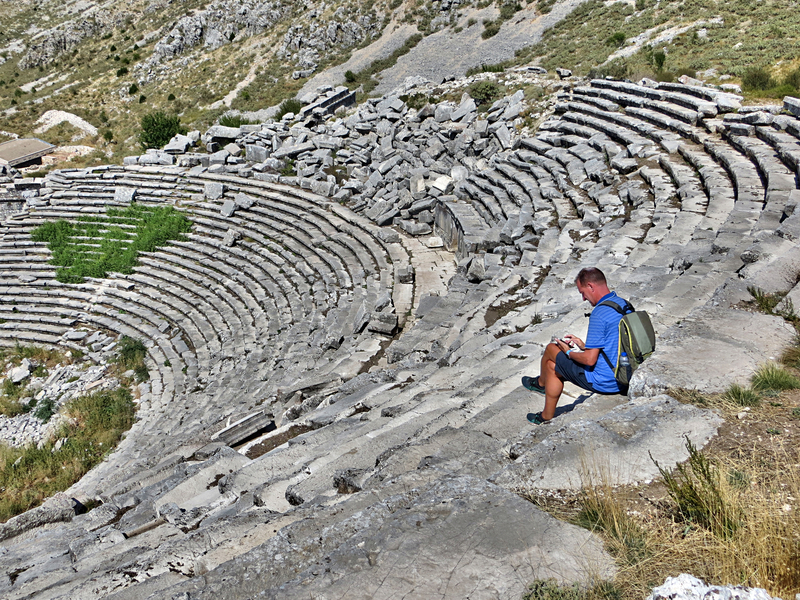 The town of some 5,000 people, then, had a distinct elite, wealthy superstrata and, as a regional center, a theater that seated 9,000 people with incredible views over the valleys below. 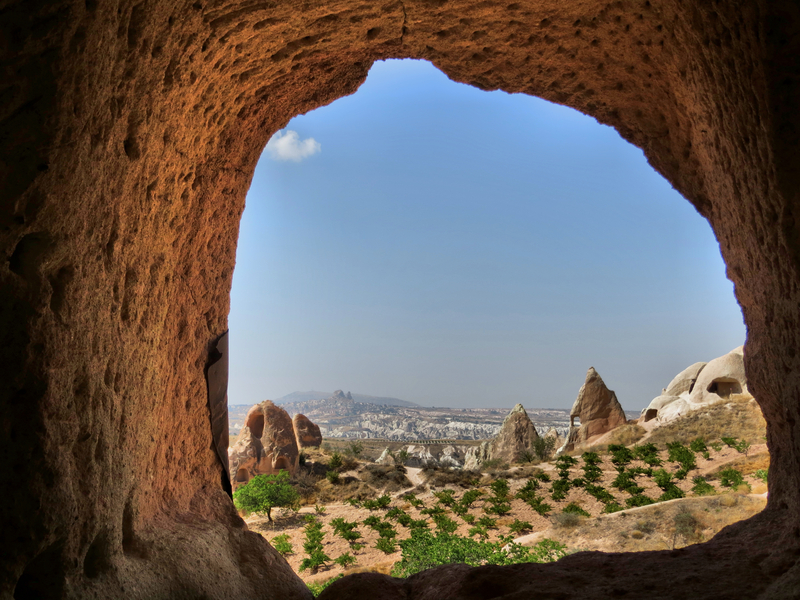 Now we’re headed off to Cappadocia, with a quick one-night stop en route, and from there to Ankara, the capital. 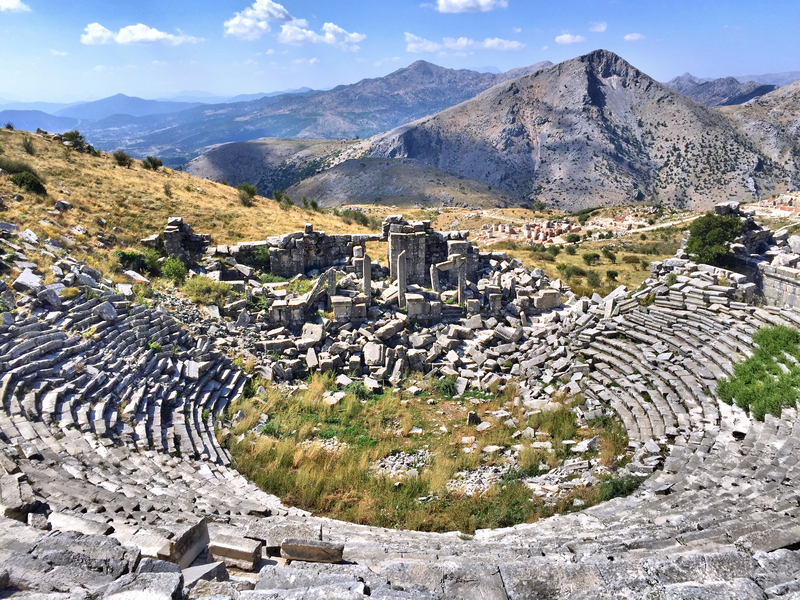 The theater at Sagalassos with stunning views ov the valley below and mountains beyond. Alexander the Great conquered the area and brought it into the Greek orbit, so that big hill in back is called Alexander Hill. One of the gates into the main square of Sagalassos. There were four of the huge pillars you see here, each topped with a statue of one of the four wealthy local citizens who financed the construction. The Nymphaeum, a fountain complex 28 feet high and over 80 feet across. 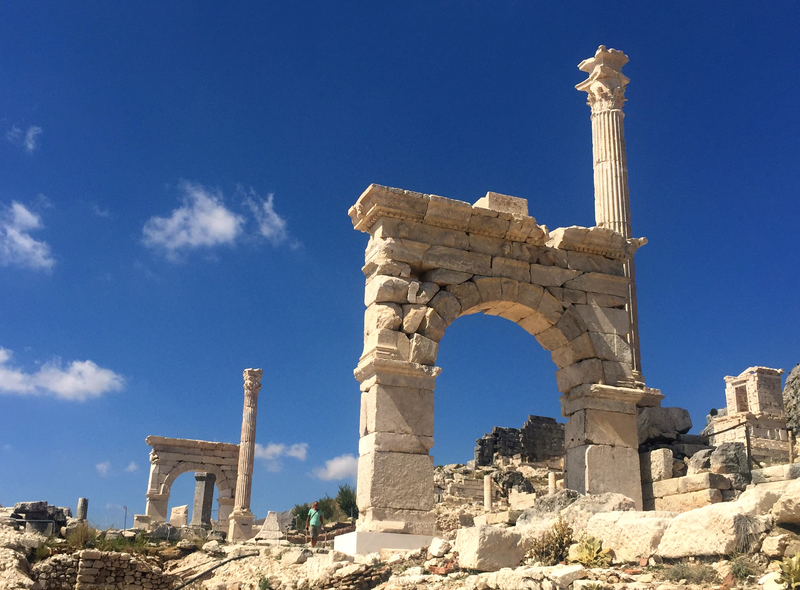 While excavating a nearby fountain, the researchers discovered the original water source so it’s being fed by the same water as in ancient times. These are the ruins of an “urban mansion”, a residence for the super-rich. So far they’ve excavated 80 rooms believed to have existed over eight floors. Nearby was also a “luxury market” suggesting that gaps between the wealthy and everyone else has been around for a while.